The Ghis-Nekkor plain, located in the north of Morocco, is a vulnerable area for climate changes due to its influence by the Mediterranean front and due to its strong urbanization. Therefore, a study of the climate evolution changes of the cited plain is essential for conducting climate change impact studies. However, the various studies of future projections, including those of the Intergovernmental Panel on Climate Change (IPCC), are based mainly on outputs of low-resolution climate models that do not allow to approach the regional and local scales. Hence, the objective of this work is to use the outputs of the Operational Regional Climate Models of the Cordex-Africa Project to evaluate future climate change in the Ghis-Nekkor plain. 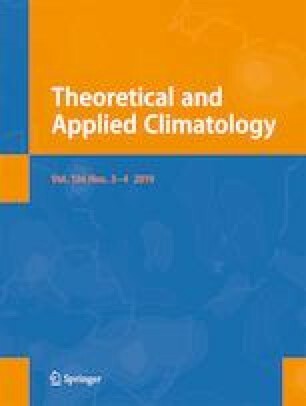 On the first hand, a comparison between the Regional Climate Models (RCMs) using Taylor’s diagram method was performed, then the best models HIRHAM5 for precipitation and RACMO22T for temperature, which performed well in the study area, were retained. The main results from the projections for 2050 CE show a downward trend for precipitation about 18% and an increase in the average temperature of 0.5 °C under the Representative Concentration Pathway 4.5 (RCP 4.5). These predicted parameters were subsequently exploited to study the future climate change by using the De Martonne aridity index (AI) and the standardized precipitation index (SPI). The latter predicts an increasingly dry climate for the Ghis-Nekkor area; it will be more prone to both moderate and severe droughts but less prone to extreme drought by 2070 CE. Moreover, the results also show a change of climate regime becoming arid at the level of the plain (AI = 9.92 mm/°C) by 2080 CE. Finally, a comparison between the two indices (SPI and AI) was carried out, revealing a statistically significant correlation between them for both the observation (1982–2012) and future (2021–2050) periods. The first application of the obtained results is exploited to estimate quantitatively the future groundwater recharge variation in time for the site study under RCP 4.5 and RCP 8.5 scenarios. The results show that for both scenarios, a reduction of the groundwater recharge would be expected around 40% for the period 2020–2080, as the climate regime would be also arid by 2080 CE. This research is a part of the Ph.D. thesis of the first author at the Mohammadia School of Engineers, Mohammed V University in Rabat. The authors would like to thank the Moroccan Ministry of Water for providing data to perform this research. This research is a part of the MEDAQCLIM research project funded by the ERANET-MED EU FP7 program.